Make your child’s birthday party a blast with the Paradise Combo. The Paradise combo house features a large 13x13 bounce house area, as well as steps to climb to the top of the dual-lane slide. Kids can bounce around and play inside with the basketball hoop. You must provide your own balls for the basketball hoop. 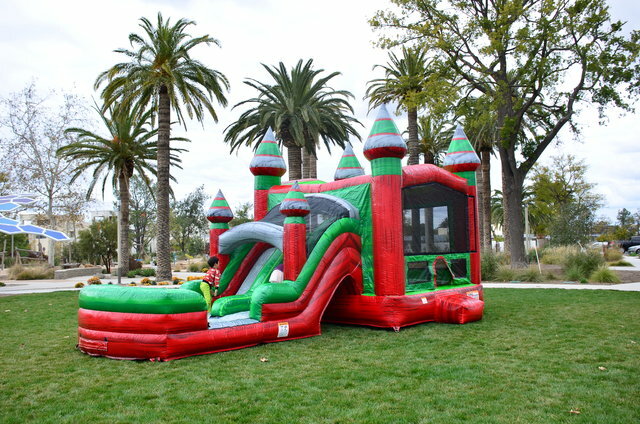 This inflatable bouncy house features safety netting all the way around for easy viewing from all angles of the party. Enhance your child’s birthday party by reserving the Paradise Combo today!